This lidded creamer on an oval base is a fine example of American Rockingham ware, which is the term for cream or yellow ware that has been dipped or splattered with brown glaze before firing. 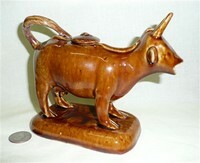 Rockingham ware was widely produced in the eastern US in the mid-1800s. 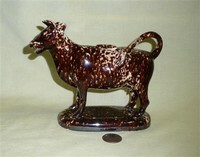 This page of the web site should therefore perhaps be termed “American Rockingham” for the coloring and glaze, but most of these creamers of this style and glaze are associated primarily with Bennington, Vermont. Vermont is famous for its cows (more of them than people, they used to brag; friendlier, too, some say. ), and I’m a Yankee by birth, so I’ve chosen to use that term. 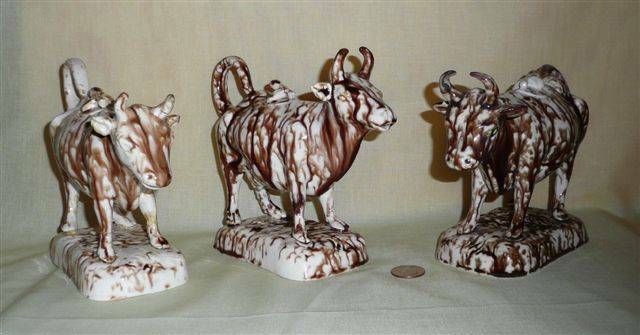 I have put these creamers in a theme of their own because, whether they were actually made in Bennington or not (and I strongly suspect most were), they are assuredly early (19c) American pottery, and as far as I know, the earliest cow creamers made on the US side of the Atlantic. Here are some examples from my collection, showing the differences in the coloring that was noted by the National Academy of Art*. The shapes and thus the molds seem quite similar, except for one of the creamers in the third picture, but no two pieces are identical. Per usual, if some expert can help me more precisely attribute these creamers, I’d be most appreciative. 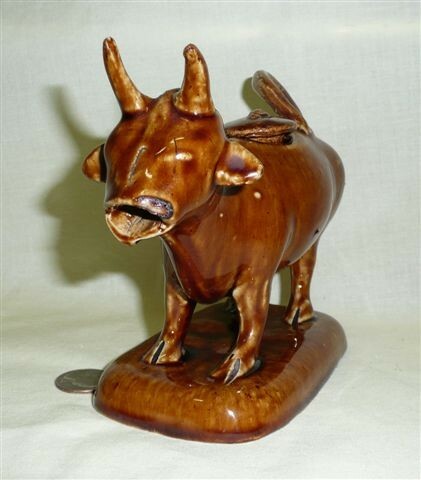 The Bennington Museum’s web site notes that “pottery has been made in Bennington since 1785 when Captain John Norton began to produce utilitarian earthenware and stoneware. The Norton pottery grew throughout the 19th century and gained fame for its brilliantly decorated stoneware featuring flowers, birds, and animals. 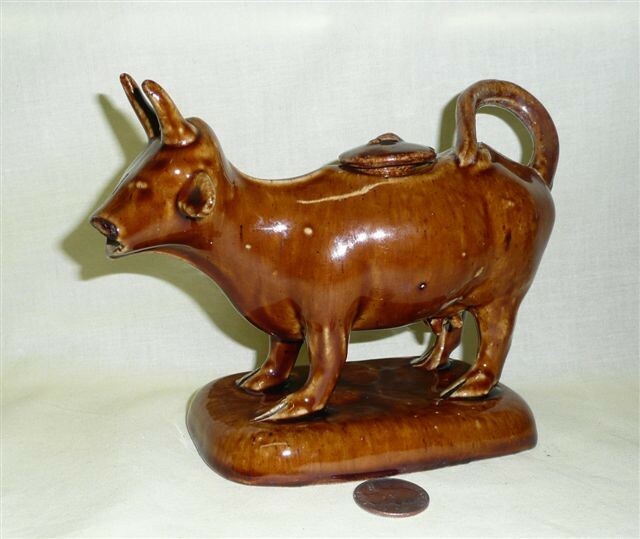 Regular pottery production ceased in 1894, though the company operated as a wholesaler until 1911. The United States Pottery company (1847 - 1858) produced ornamental objects including yellowware with Rockingham and flint enamel glazes, agate and granite wares, porcelain and parian.” These two potteries are credited with a prodigious, if relatively short-lived, output of American Rockingham. 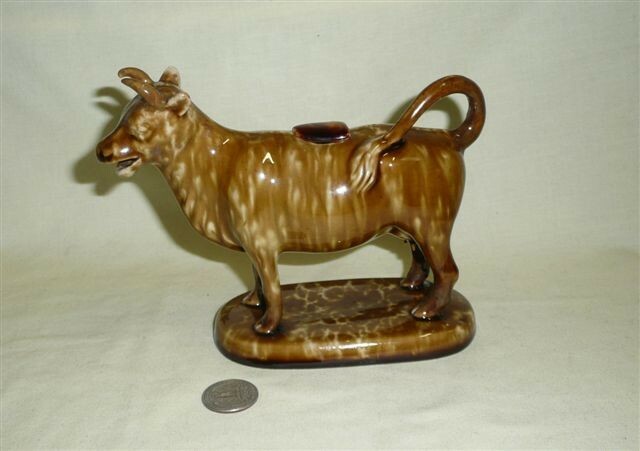 Here is what I consider to be a particularly fine example of Rockingham glaze on the most common form of Bennington cow creamer. 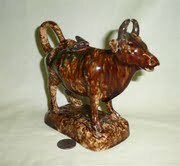 This is a beautiful example of yet another form, certainly with Rockingham glaze, and most likely Bennington. It came to me via sellers who got it at an auction in SE Pennsylvania, where it was said to date from the early to mid 1800s. In contrast to the others here, it bears a stylized fly on the lid. 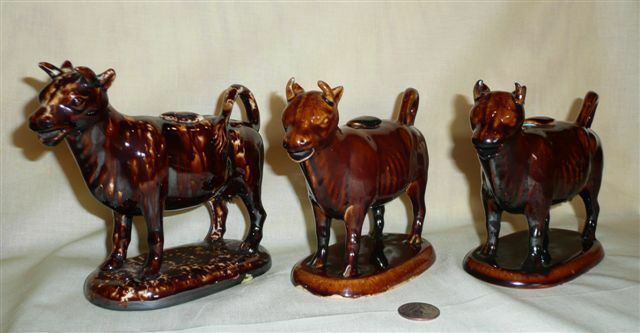 These three are similar in shape and style to the one above, but have a very different glaze, which one seller claimed indicates that they’re Pearlware from around the 1840s. For a while I showed these on my Staffordshire page, but based on their resemblance to the one above, including the stylized fly - and the fact that the sellers were all from the eastern US or Canada - I now think that they’re more likely 19c American. I sure would appreciate advice from an expert on early American pottery. This creamer is from is yet another quite different mold - these are expanded shots of the one in the right hand picture in the introduction. 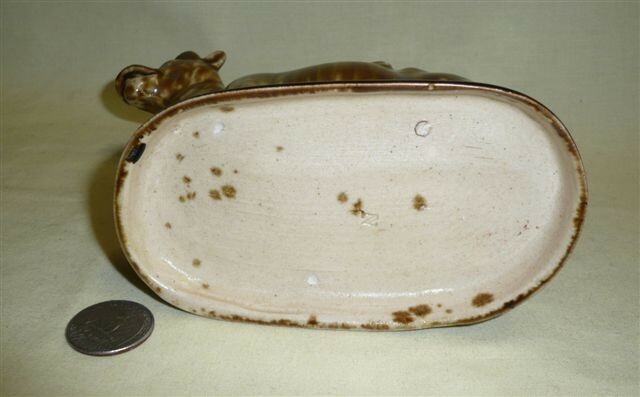 Although per usual I have no information from the seller, I have a suspicion that this one may be from potteries in Pennsylvania rather than Vermont. This is my only Rockingham Glaze creamer without a base. It’s also unusual in that the lower legs and hooves are unglazed, and its form is distinctly different than any of the others above. I believe it to be American – but the only information I have on it is that it belonged to the seller’s grandmother, who died in 1956.